My Comfort Rotary Cutter - THE GRACE COMPANY-TrueCut My Comfort Cutter. 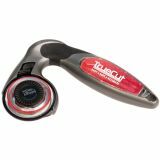 This ergonomic rotary cutter eliminates stress in the wrist and arm by aligning your wrist naturally and placing cutting power directly over the blade. Plus the unique TrueCut guide, when combined with the TrueCut Ruler Track (not included) gives you precise cuts every time and keeps your cutter from slipping off the ruler's edge. Customizable handle inserts mean you can personalize your cutter with designs or photos that your uniquely you! This package contains one 45mm cutter for right or left handed users. Cutter measures 5-1/2x4 inches. Caution: Contains sharp blade-handle with care. Imported.